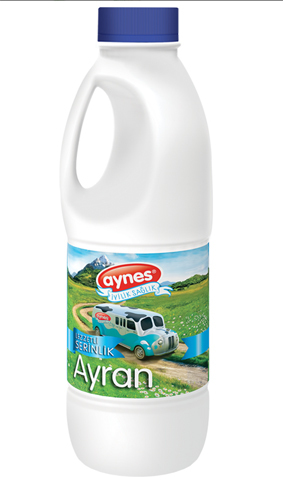 Bringing health and happiness to your table – Ayran Aynes youghurt. Index-6 introduced clean filling line of Ayran and fresh milk in Aynes Gıda Sanayi Ticaret A.Ş., Turkey, who put their trust in proven technology of Index-6 for clean filling in an effort to provide clean drinking milk in convenient bottles of varying volumes with handles. The line includes orientation module with an air conveyor for feeding bottles towards synchronization block with a capacity of 8,000 bottles/hour, based on contactless weight filling with high accuracy, using our patented filling valves for laminar flow. A thorough sterilization of bottles and caps is performed in different sections of the block before their contact with the product. Devices for preparation of sterilizing solutions and CIP for outdoor washing machine are added. The line includes synchronized labelling machine (round-label) and packer for group packing in shrink film.